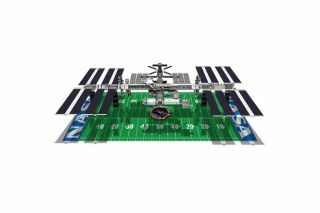 The International Space Station is roughly the size of an American football field. There has been no word on whether NASA is planning a Super Bowl in space any time soon. NASA and the Super Bowl may not be two things you'd normally put in the same sentence together, but Sunday's big game wouldn't be the same without innovative spinoff technologies from space exploration. From helmets to headsets to the communications satellites that allows fans to watch around the world, NASA's legacy can be found throughout the Super Bowl Sunday experience. So when the Seattle Seahawks face off against Denver's Broncos, the teams will have NASA to thank for some of their basic tech needs. The STS-129 astronaut crew presents the space-flown flip coin to NFL officials at the Pro Football Hall of Fame on Jan. 27, 2010. The coin will decide the start of Super Bowl 44 in South Florida. In the 1960s, engineers at NASA's Ames Research Center in California studied a shock-absorbing foam with the intent of minimizing the stresses suffered by pilots subjected to high g-forces. Known as Temper Foam, or memory foam, the polyurethane material shapes itself around objects after compression and returns to its original form. Today, the material has a wide variety of everyday uses, including serving as the padding inside of football helmets, NASA officials explained in a statement. Cushion isn't the only part of the helmet NASA had a hand in. The outside shell of the familiar headgear is made of Lexan. Originally developed by a German scientist in the early 1950s, the material caught the eye of NASA engineers, who tested it and realized that it could stop a bullet, a micrometeroid, or the sacking of your favorite quarterback. NASA has helped to improve communication not only between coaches but around the world. With the launch of the NASA-developed Telstar 1 satellite in 1962, the world realized a new era of television broadcasting. Part of a multi-national agreement, the original satellite sought to extend communications across the vast Atlantic Ocean. Today, its descendents allow fans to watch the Super Bowl from 185 countries. Not all of NASA's football links are quite so direct. Astronaut Leland Melvin served on two space shuttle missions after he began training as an astronaut in 1998. But he had already gotten up close and personal with NASA's helmet technologies, having been drafted as a wide receiver by the Detroit Lions in 1986. He reported to the Dallas Cowboys the following year, before a pulled hamstring spelled the end of his football career. In 2010, officials made the opening toss of Super Bowl XLIV with a space-flown coin that had traveled to heights only dreamed of by most NFL fans. The silver medallion logged a total of 4 million miles over the course of 171 orbits around the Earth aboard the space shuttle Atlantis, flying with football player-turned-astronaut Melvin. On Jan. 27 of that year, the coin was presented to the Pro Football Hall of Fame before heading to Florida to open the Big Game. In 1992, television station CBS asked NASA if it would be willing to provide the pre-game coin toss on board the Discovery Space Shuttle. Knowing that a coin flipped in space would never actually land, Canadian astronaut Roberta Bondar held the coin in her right hand and flipped twice in space before releasing it to drift. According to the crew, the coin came up heads, the same as the actual pre-game coin toss came up. The Super Bowl wouldn’t be complete without its long-heralded commercials, and NASA has played a role there too, agency officials said. During the 2011 Super Bowl, NASA'snext-generation humanoid robot Robonaut 2 debuted during a General Motors advertisement that showcased the robot's ability to work alongside humans. The two companies are working to develop climbing legs for the robot to allow it to move outside the football-field sized International Space Station, with the hopes that it can one day take over tasks deemed too dangerous for astronauts. Though few link football and NASA together, the two share quite a bit of common ground. Athletes may not be kicking field goals on the moon in the near future, but they certainly have quite a few reasons to thank NASA.